Barin Ghosal (1944-2017), co-editor and a pivotal member of the Kaurab group, was one of the most innovative anti-mainstream writers of his generation. From his very early years, Barin focussed on alternative literary pursuits, rigorously experimenting with the structure of the modern Bangla novel, as well as contemporary poetic language. In the early 1990s, Barin wrote a series of essays in Kaurab and other magazines, introducing "Expansive or Supra Consciousness" (or EC/SC) - a new literary theory that provided a novel semantic-semiotic analysis of poetic language and thought. 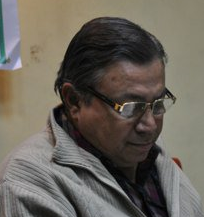 He spent great energy identifying, analyzing, theorizing concurrent trends in contemporary Bangla poetry. Barin Ghosal has authored more than a dozen books and has been felicitated by several Bengali literary organizations. It was a common sight to see him flocked by gangs of younger poets at poetry festivals and book stops. His poetry is difficult, intellectual and much respected by younger experimental writers. His book-length poem "Satkar" (Cremation) is a rare feat in Bengali poetry. Barin has also authored a collection of short stories and a few novels. His maiden novel "MaTaam" (Tiltmeter, 1989) which is based on a bizarre, magical tale of a matriarchal community, won him critical acclaim. Upon his demise in 2017, hundreds of Bengali writers, poets and artists paid resounding homages in social network to reveal the silent popularity and following that built up over the years.